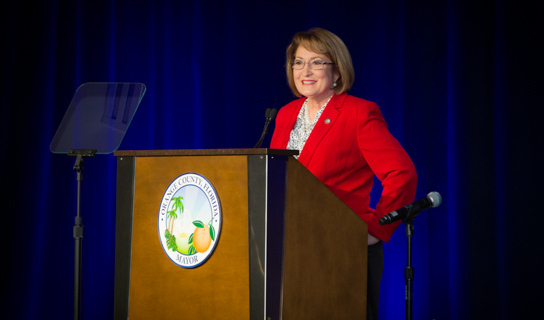 On Earth Day, April 22, Mayor Teresa Jacobs welcomed the community to the 2016 State of the County address at the Hyatt Regency Orlando on dazzling International Drive, the heart of our thriving hospitality and Convention Center district. With more than 750 citizens in attendance, and many more watching online, Mayor Jacobs provided guests with an overview of Orange County’s prosperous economy, strong job growth, stable and fiscally responsible management of County finances and well-defined plans that will enhance Orange County’s quality of life for future generations to come. Since 2010, an astounding 96,900 jobs have been created, which last year spurred the construction of 2,600 new homes catapulting Orange County’s 2015 building permit valuations to $1.9 billion, a staggering 17 percent increase from the prior year, without any property tax hikes, millage rate increases or cuts to County services. For the third year in a row, countywide property tax revenues are up, with more than $386 million generated in 2015. With $200 million from “INVEST in Our Home for Life” already allocated for road construction and transportation improvements for our citizens, the remarkable enhancements to Orange County’s infrastructure will improve our quality of life and strengthen our region’s infrastructure, roads and transportation options, including a focus on pedestrian safety. Improving our transportation assets is a vital part of our continued economic growth as we continue to see regional improvements, including the groundbreaking for SunRail’s Phase 2 South and I-4 Ultimate milestones. On a national scale, Orange County is doing extremely well. Gallup ranked the metro Orlando region No. 1 in the nation for job creation in 2015. Additionally, KPMG named the region as the second-most cost-competitive community in the U.S. for business. Since taking office in 2011, one of Mayor Jacobs’ priorities has been to work toward a sustainable future and streamline the County’s development review processes to make it more transparent, efficient and predictable. A first step was to become more responsive to customer needs in development permitting by establishing “One-Stop.” Mayor Jacobs also created the Regulatory Streamlining Task Force to evaluate the County’s development review processes and embarked on the County’s first Sustainable Orange County Plan. Through an innovative approach to sustainability and development the region continues to move forward by bringing the County’s 60-year-old land development code into the 21st century. Known as Orange Code, our new code process announced at the State of the County, represents a radically simplified and sustainable way to govern how land is developed. Through this new approach Orange County is striving to create inviting places, spaces, and neighborhoods, each with a distinct feeling. Whether it’s neighborhoods with quaint restaurants and coffee shops within walking distance, or more developed areas, Orange Code will give us the tools to achieve these unique places. As Orange County moves to this new platform, we’ve selected I-Drive as the perfect place to roll out Orange Code. As we continue to invest in our future, we also remain focused on transparency and providing information about our communities. With the launch of the newest web and mobile app, OCFL Atlas, citizens can now pinpoint new projects in their communities and access real-time development data, board meeting details and project locations. As the Convention Center enters its third year of our $187 million dollar capital investment project, Orange County continues to invest in fresh, high-tech meeting spaces and the world-class amenities that are necessary to providing a superior client experience. The Orange County Convention Center propels a significant economic engine, hosting more than 200 events a year, welcoming 1.4 million attendees and contributing more than $2 billion to the area’s economy. Maintaining a relentless focus on entrepreneurship and economic prosperity, Orange County continues to be a prime destination for companies to do business. Through the National Entrepreneur Center, the Central Florida International Trade Office and working with UCF’s Business Incubator at Research Park, the region is seeing tremendous gains in its innovation economy. Orange County also continues to focus heavily on Modeling, Simulation and Training through its MS&T Blue Ribbon Commission. Through the collective efforts of the Blue Ribbon Commission, National Center for Simulation, UCF, the Corridor, the National Center for Simulation (NCS) and its Metro Orlando Defense Task Force members and other partners — another $14 million in state dollars is headed to Central Florida. These dollars represent the final stage of Orange County’s three-year effort to help the Research Park keep up with its growth. Totaling $42 million, these funds will go to purchasing buildings, and offering space to the military at a lower cost. By investing in MS&T, Orange County is helping to contribute more than $4.8 billion to Florida’s gross state product, including more than 27,000 jobs for Floridians, with an average annual salary of almost $70,000. In addition to the tremendous investments in infrastructure and innovation, much work has been done to care for Orange County’s citizens and children impacted by homelessness. By late 2015, the Central Florida Commission on Homelessness ended Veterans homelessness, with an effective rate of zero. Homeless families however, remain a difficult challenge. In early 2015, a report was released to look at how effectively dollars are being spent with regard to housing homeless families. The Orange County Committee of the Central Florida Commission on Homelessness is already working to make those changes. A key finding in that report was the need for affordable housing. Through the INVEST initiative, there are multiple programs and projects aimed directly at expanding access and inventory of affordable housing for strategies in addressing this shortage. Orange County’s housing initiatives will receive $5 million over the next five years to help fund these efforts, including an Affordable Rental Housing project, which will create 70 brand new affordable housing apartments, with 20 percent of the units dedicated for the homeless population. This also includes the renovation of the Wayne Densch Center and a single-family subdivision called the New Horizons Project. Orange County’s projected $2 million dollar investment to the Wayne Densch Center, in partnership with Florida Hospital, Ability Housing, Wayne Densch Charities, the Central Florida Foundation and the Florida Community Loan Fund will support the renovation of the facility and provide a vital housing resource for families, including those who have challenges due to mental illness, addiction or physical disability. The New Horizons Project in South Apopka, formerly known as Hawthorne Village, will also provide 56 homes for low- and very low-income households in need of housing. Through the same partnership approach, Orange County is helping to address Central Florida’s heroin epidemic with the Orange County Heroin Task Force, which Mayor Jacobs convened in 2015 with co-chair Sheriff Jerry L. Demings. The Task Force’s 37 recommendations included bond increases for suspected trafficking as well as a public information outreach campaign using traditional and social media to warn citizens about the deadly nature of heroin. The Task Force also recommended the activation of a “blanket prescription” for Naloxone, a life-saving drug when faced with fatal overdoses. Mayor Jacobs recently testified before Congress about the deadly impact heroin use poses to Orange County citizens and provided insight and research based on the findings of the Orange County Heroin Task Force. Photos of the 2016 State of the County address are available on Flickr for use by the media.